This section introduces users to key navigation elements in AtoM, as well as recurring page elements that can be used to perform a variety of functions throughout the application. Navigating involves understanding the current location (entity and page), what can be done from that location (view, edit, add new, search, etc. ), how to get related entities, and how to go to other pages to do other things unrelated to the current entity. The header bar is the primary means to access, manage, and create content in AtoM. It is persistent, meaning it remains available on all pages throughout the application. The header bar includes the log-in button, quick links menu, language menu, clipboard menu, search box, browse menu, and site logo for all users, and the main menu for authenticated (i.e. logged in) users. Additionally, an administrator can add a site title and a site description via Admin > Settings > Site information, and then determine whether or not these are visible in the header bar via Admin > Settings > Default page elements. The visibility of the site logo can also be controlled via Default page elements. For more information see Settings. An administrator can also use the settings available in Admin > Settings > Default page elements to hide some user interface elements, including the language menu. See Settings. The main menu only becomes visible in the header bar after a user has logged in. Depending on a user’s access privileges, the main menu may show/hide different options - for example, only administrators will see the Admin menu. Access privileges are based on defined user roles (see User roles). The log-in button, located in the header bar, directs unauthenticated (i.e. not logged in) users to a log in screen where users with a user account can enter their credentials (email and password) to log into the application. Once a user has successfully logged in, the log-in button will display their chosen user name. Clicking on the log-in button after logging in will reveal a drop-down menu with the option to log out, or to visit the user’s profile page, where a user can upate their credentials (username, email, password). The quick links menu, located in the header bar in the top-right corner of the page, allows users to navigate to static pages and/or other external links added to the application by an administrator. By default, several static pages are included in AtoM and available through the quick links menu - the home page and the about page. Administrators can customize the content on these pages via the user interface and/or create new static pages (see: Manage static pages). Additionally, external links can be added to the quick links menu (or any menu) via Admin > Menus - often an administrator will add a direct link to their institution home page, and/or a link to the AtoM documentation (as a”Help” link). Don’t need or want the quick links menu in the header bar? You can remove it entirely if you prefer. Administrators can also change what links appear in the quick links menu (and all menus) via Admin > Menus. For more information, see: Manage menus. The language menu, located in the header bar in the top-right corner of the page, allows the user to switch to any of the supported languages in AtoM. It is available to all users (whether or not they are logged in). It is represented by a icon - clicking the globe icon will reveal a drop-down menu that lists the available languages. When a user selects a language from the menu, the page will reload and all translated interface elements (such as menus, edit templates, tooltips, labels, help text, etc.) will appear in the selected language, and will remain in the selected language until the user changes the language again. If the language menu is not needed for your site, it can be disabled and hidden via Admin > Settings > Default page elements. For more information, see: Default page elements. Each sub-menu is designed as a drop-down menu - hovering over an icon in the main menu will cause a tooltip to appear with the name of the sub-menu (Add, Manage, Import, or Admin). Clicking on one of the icons will cause the drop-down to reveal the options available. Access to the elements of the main menu (the sub-menus) depends on the access privileges associated with each user account. 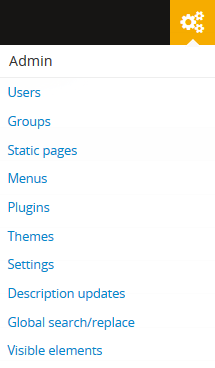 Consequently, some users may not see some of the icons for the sub-menus in the main menu after logging in. Access privileges are determined by the user role associated with a user account - for example, a contributor will see the Add and Manage menus, but not the Import or Admin menus. Only adminstrators will see all 4 sub-menus (Add, Manage, Import, Admin) in the main menu. For information on user roles, see: User roles. For information on managing User accounts see: Manage user accounts and user groups. For information on changing the permissions associated with an account or a group, see: Edit permissions. The Add menu’s options will redirect users to blank records in edit mode, ready for data entry. Using the Add menu, users can quickly create new accession records, archival descriptions, archival institutions, authority records, functions, and terms. All records are created independently of other records, and will not be a part of a pre-existing hierarchy - that is to say, they will be top-level records. The Manage menu is distinct from the Browse menu (available next to the search box in the header bar), in that it offers users direct access to browse pages that are not available to unauthenticated (i.e. not logged in) users - public users who are not logged in cannot view accessions, donor records, physical storage locations, rights records, or access the full taxonomies list and the jobs page. The import menu allows authenticated (i.e. logged in) users with sufficient access privileges to import records into the application. By default, only administrators have access to the import menu - however, administrators can also change user and group permissions (see: Edit permissions and Manage user accounts and user groups). Two options are offered in the dropdown menu - XML (short for eXtensible Markup Language) and CSV (short for Comma-Separated Values). Selecting one of the options from the Import drop-down menu will redirect the user to an import page specific to the format chosen. Using these options, an administrator can import descriptions and terms into AtoM. The admin menu allows users with administrator access to customize AtoM to meet institution-specific requirements and to manage user accounts, user profiles and access privileges. An administrator can also create and manage static pages, alter application menus, change the visibility of elements in the header bar, and change other application default settings. By default, the admin menu is only visible to users with administrator privileges. However, an administrator can also change user and group permissions (access privileges) via the Admin menu. The browse menu provides persistent access to browse pages for some of AtoM’s key entity types. Browsing allows a user to see all records that have a certain type of access point (such as subject, name, or place) or other type of filter, such as media type or type of entity. Users can then browse through the results provided, and/or further narrow the results via the use of facet filters. In AtoM’s default theme (the Dominion theme) the browse menu appears in a drop-down next to the search box in the header bar on all pages. 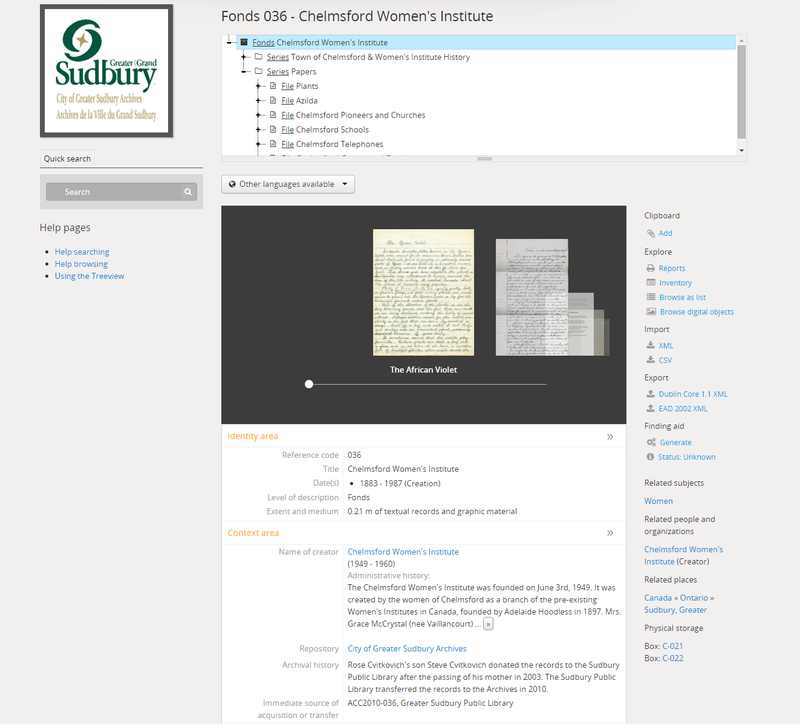 The drop-down menu contains links to browse pages for archival descriptions, authority records, archival institutions, subjects, places, and digital objects. Additionally, a browse menu is included on the home page when users first log in to the application. Administrators can change what links appear in the browse menu (and all menus) via Admin > Menus. For more information, see: Manage menus. The search box is used to find descriptions in AtoM that contain text matching a search query. The search box is located in the header bar on all AtoM pages, including the home page. By default, when a user enters text and presses enter, the results returned are for archival descriptions. When multiple results for a record type exist, the typeahead drop-down includes an option to view all records for a particular record type - clicking the “View all” link for a particular type of record will redirect the user to a browse page of results. Additionaly, when a user has viewed an archival institution record, clicking in the search box will reveal a set of radio buttons that allow the user limit the search results to the holdings of the most recently viewed archival institution, or to search globally (i.e., across all records in the application). For more information on searching in AtoM, see: Search. See also: Advanced search. The site logo is the graphic that appears at the top of all pages in the left-hand corner of the header bar in AtoM. Clicking on the logo will take the user to the home page. AtoM ships with a default logo that can be replaced by administrators to theme the application to their own institution or network if desired: see Site logo. Users who do not have a logo, or who simply want to add a site title to the header bar, can do so via Admin > Settings > Site information, and make it visible in the header bar via Admin > Settings > Default page elements. The site title, when visible, will also act as a hyperlink to the home page. To add and control the visibility of the site title, you must be an administrator. For more information, see Settings. The title bar is a contextual element that appears throughout AtoM on various different page types, offering the user an indication of the type of page, and/or the name of the record, currently being viewed. On a view or edit page, the title bar displays the name (title) of the current entity. The title bar appears at the top of core entity records in AtoM, including archival descriptions, authority records, archival institutions, functions, and terms (such as subjects and places), as well as at the top of physical storage locations. On archival descriptions, the title bar also displays the level of description of the displayed description. On Donor and accession records, the title bar displays a message indicating whether the record is in view or edit mode, with the record’s name/title display below (as a sub-title). On Browse and Search pages, the title bar displays the number of results returned for the current query. Elsewhere in the application, the title bar gives context to the user about the page type currently being viewed. Blue text always represents a link to a related entity (for example, from an archival description to the authority record of the record’s creator). When you hover your cursor over a link, the text darkens in color. Text links behave similarly to internet hyperlinks, and can be used as navigational elements: clicking on a text link will cause AtoM to redirect a user to the related record referenced in the text of the text link. Some text links are white in the ArchivesCanada theme, such as in the context menu (including the treeview) and the breadcrumb trail at the top of many entity view pages. Text links in the Dominion theme included as the default theme in AtoM are almost universally blue. The context menu appears on all view and some edit pages to provide greater contextual information about the record currently being viewed. 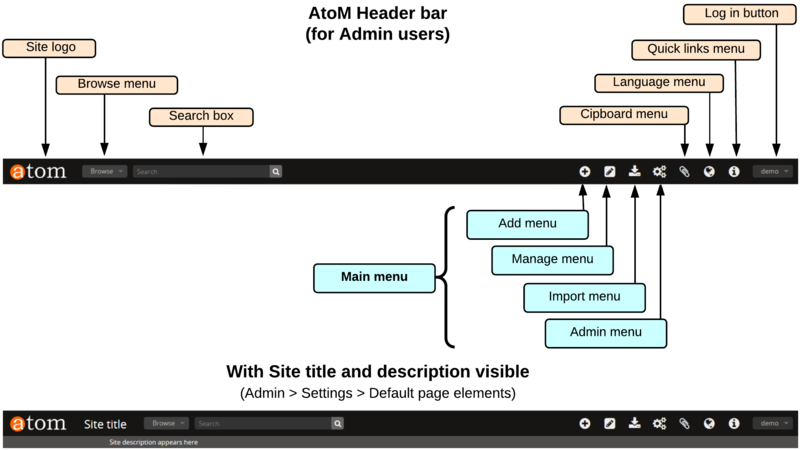 AtoM’s view and edit pages are generally displayed in the user interface in either a 2 or 3 column layout - the current record’s display data is presented in the central part of the page, while the side column(s) are generally used to provide additional options and further contextual information to enhance user orientation and navigation. When viewing an authority record for a person, family, or corporate body, the left-hand side of the screen will show any relationships with archival descriptions, where the agent (the person, family, or corporate body described in the authority record) is linked as either a creator (or as an agent in any other event), or when added as a name access point. The right-hand column of the page includes available export formats. When a relationship is created between two authority records or between an authority record and a function, the relationship is expressed in the body (i.e. the main part or center column) of the authority record’s view page, in the “Relationships” area of the record. 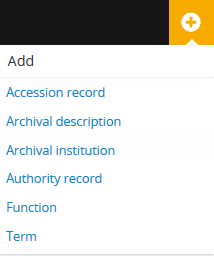 When viewing an ISDIAH record for an archival institution, the context menu displays the institution’s logo and a list of holdings on the left-hand side, with contact information for the repository provided on the right-hand side of the record. The contact information is drawn from the information added to the “Contact” area of the archival institution record. On Browse and Search pages, the context menu includes facet filters that allow the user to iteratively narrow the results presented. If the browse page is for a term that can be organized hierarchically in a taxonomy (such as a place or subject term), a version of the treeview is also presented, showing users the terms position in the hierarchy as well as related “sibling” (i.e. on the same level) terms. Column headers appear at the top of the lists on list pages and some browse results (e.g., subject and place browse pages), and give the name of the field for whatever is being isted below. On some pages, the column headers include a caret icon next to the column header field name - when pressed, these icons will reverse the sort order of the data in the list based on that column (i.e., changing from A-Z to Z-A, or from most recently updated first to oldest update first). Column headers appear wherever display data on a page has been organized into a table, and are used extensively throughout the pages available in the Admin menu. Information areas appear on view and edit pages of any standards-based description template in AtoM, and group related fields based on the organization of elements of description in ICA or other supported descriptive standards. They are comprised of a number of fields in the body of the information area, and an area header, whose name is drawn from the related area or section of the standard upon which the descriptive template is based. By default, when no data has been entered into a field in an information area’s edit template, the field is not displayed when in view mode. Consequently, the size (length on a page) of an information area will depend on the amount of data that has been entered (or imported) by a user. If the lower-levels of description include more than 10 digital objects, a count of all digital objects at lower levels, and a button to view all in a browse page. The carousel is intended as a navigational element, and is not optimized for viewing or browsing all related digital objects. 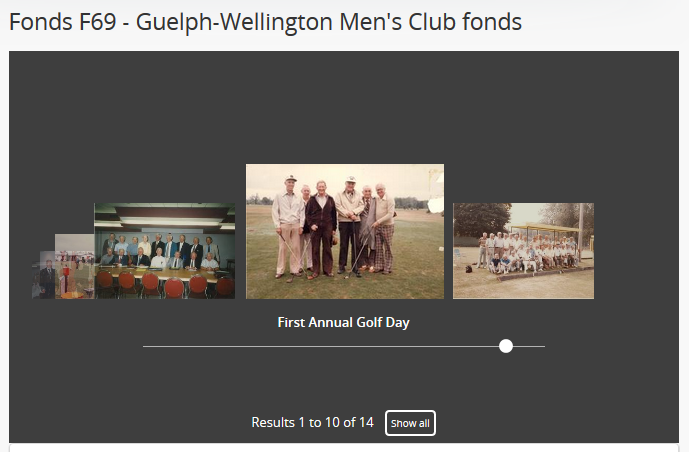 Using the carousel, a user can quickly browse the first 10 results - clicking on a thumbnail will load the related lower level of description (child record), where a larger version of the image and its description can be viewed. By default, whenever there are more than 10 digital objects at lower levels, only the first 10 will be displayed; a total count of related digital objects, with a button to “View all” digital objects in a tile-based digital object browse page appears to indicate to the user that there are more digital objects than those displayed, and providing an option to view them all. If no slider appears, this means there is only one digital object at a lower level of description. If there are more than 10 digital objects, click the “Show all” button to view them all in a tile-based browse page. Click on a thumbnail in the browse page to navigate to the related archival description and a larger version of the digital object that the thumbnail depicts. The carousel can be disabled and hidden if it is not desired, via Admin > Settings > Default page elements. For more information, see: Default page elements. In information science, a facet is a clearly defined component (based on a particular concept group, characteristic or aspect) of a class or subject. Facets are used in a system of faceted classification, which “allows the assignment of an object to multiple characteristics (attributes), enabling the classification to be ordered in multiple ways, rather than in a single, predetermined, taxonomic order.” (Wikipedia). Facets are made up of clearly defined, often mutually exclusive categories drawn from the properties of a group of information elements. When applied as filters, facets allow a user to access and order query (search or browse) results in multiple ways dynamically. Faceted searching and browsing has become popular in both library catalogues and e-commerce websites (such as Etsy, Amazon, Walmart, etc) to help users narrow down results to specific categories - for example, a music website might categorize its music by adding an artist facet, a genre facet, a price-range facet, and so forth. Users can then click on a particular sub-class to narrow the results displayed to only those that match the selected facet - choosing “Virginia Woolf” from an author’s facet in an online library catalogue would display only books where Virginia Woolf was listed as the author. In AtoM, facet filters are available to users on search and browse pages as a means of grouping and narrowing results by a common characteristic. They are drawn from available fields within the entity or record type being browsed or searched. A count of the records included in each facet appears next to the facet label, giving users a sense of how many search/browse results fall under each facet result. Facet filters are configured not to display if there are only 0 or 1 facets. So for example, if you perform a search, and none of the results have digital objects attached, then the “Media types” facet filter will not display. Only those facets relevant to the results being displayed will appear in the user interface. Facet filters in AtoM are configured so that each facet displays its results with the highest number of matches at the top. Currently, AtoM will only display a maximum of the top ten matched results in each facet. Facets are displayed in the user interface as drop-down menus; each facet can be expanded to view its available results/matches, or collapsed to hide match results, by clicking on the facet title - facet titles are highlighted in dark grey when opened in AtoM’s Dominion theme. Available facet results appear below each facet heading as blue text links. When clicked by a user, the search/browse results on the page will reload, filtered to show only results that match the facet filter selected - for example, selecting “Series” in the Level of description facet on an archival description search/browse page will reload the page results to display only series-level descriptions; clicking “Ontario” under the Places facet will reload the page to display only results that have a name access point of “Ontario” added to their descriptions. When a facet match result has been selected, the text changes from a blue text link to black underlined text. By default, all facet filters are set to “All” when a user first arrives at a search/browse page (unless a user has arrived from a pre-filtered query - for example, clicking “Browse all holdings” in the context menu of an archival institution page will take the user to a browse page filtered to the holdings of that institution). the “All” filter will become a blue text link when another filter is engaged; clicking “All” will then remove the current facet filter and refresh the results page. When a filter is applied, all other facet results will be refreshed to reflect the current selection, presenting filter results that apply to the current results - for example, when “Ontario” has been applied as a place filter, the “Levels of description” facet results will now display results that apply only to the records being displayed (records with an “Ontario” place access point), until the previous facet filter is removed. Currently facets are only available on archival description, authority record, and archival institution search and browse pages. Additionally, filter buttons by media type are available in the top-right corner of the Browse digital objects page, which allow a user to limit the results by available media type (image, audio, video, text, or other). Below, an outline of each facet filter has been provided, with information on what field in the related record the information is being pulled from. For more information on working with archival descriptions, see: Archival Descriptions. For help with a specific standards-based data-entry template, see: Data entry / templates. For more information on working with archival institutions, see: Archival Institutions. For help with specific fields in the archival institution edit template, see: ISDIAH template. For specific instructions on working with archival institution access points, see: Add access points to your archival institution. Maintained by: Lmits results to those records being maintained by the related archival institution. Depends on the authority being linked to a repository via the “Maintaining institution” field in the authority record - for more information, see: Link an authority record to a repository as its maintainer. Occupations: Limits results to those authority records with a matching access point added to the Occupations field in the “Access points” area of the authority record edit template. For more infomration on working with authority records for people, families, and corporate bodies, see Authority records. For help with specific fields in the authority record edit template, see: ISAAR(CPF) template. The usefulness of of the available facet filters depends on the level of detail included in the related records. For example, if no place access points have been added to the archival descriptions in your installation, then no Places facet filter will be shown. The richer your descriptive data, the more useful the facet filters will be. By default, filter options are set to display “All” when a user arrives to a browse page (unless a specific query has brought them there that engages a filter). Click on “All” under a facet to remove an applied filter. Alternately, you can click on the related filter tag that will appear above the search or browse results. For more information on filter tags, see: Search; see particularly Institutional search box delimiters for a screenshot and example application of the filter tags. When a filter is applied, all other facet filters are updated to provide filters that relate only to the results currently being displayed. For example, if you filter by Level of description to display only series-level archival descriptions, all other facets will only show results that relate to the series-level descriptions, until the first facet is removed. In general, facet filters in AtoM are mutually exclusive - when one filter is applied, no further filters can be applied for that facet. However, if multiple name, place, or subject access points have been added to a description, you may be able to apply more than one name/place/subject filter to the results. For example, if a group of archival descriptions all bear the subject access points “Logging” “Industry” and “Unions”, when a user filters by “Logging”, the option to further filter the returned results by common subject access point (“Industry” and “Union”) would remain. If no data exists in the related description fields for the records available under a facet, or there is only one result, then no facet filter for that data will appear. The button block allows authorized users to add, edit, delete, move, and duplicate content and to save or cancel changes made in the edit pages. It appears to authenticated (i.e. logged in) users with sufficient access privileges at the bottom of all descriptive template view and edit pages, including accessions (and deaccession records), archival descriptions, archival institutions, authority records, terms (such as places and subjects), functions, physical storage locations, donors, rights records, as well as on any other page or content type where a user might have to add, edit, or delte data (e.g. static pages, user and group permissions pages, etc). In short, the button block appears anywhere a user will need to perform actions (add, edit, delete, move, and/or duplicate) on user data and/or data entry templates in the application via the user interface. The options available in the button block depend on the possible actions associated with an entity or record type. For example, the button block on an archival description’s view and edit pages includes a “More” button that does not appear in any other button block throughout the application - when clicked, further user options are revealed, including: Link physical storage, Link digital object, and Import digital objects (actions which only relate to archival descriptions). Add new: Opens a blank record in edit mode. If you are viewing an archival description when you click “Add new”, the new record will be created as a child record of the current description - i.e., it will be added as a lower level of description. Save: Saves the current record when in edit mode. All additions and changes made by the user to the current record are saved; the page will reload in view mode. More: Only available on archival descriptions and accessions. Reveals several further options. On archival descriptions, these include: Rename, Update publications status, Link physical storage, Link digital object, Import digital objects, and Create new rights. See: Rename the title or slug of an archival description, Physical storage, and Upload and manage digital objects. If a digital object is already linked to the description, “Edit digital object” will be available instead of the link option - see: Edit digital objects. If rights have already been added to the description, the option to “Manage rights inheritance” will be available in addition to Create new rights - see: Manage rights inheritance. On accessions, the More menu includes the option to create new rights - see: Rights. The above list is not intended to be comprehensive - there may be other buttons found in the application! A breadcrumb trail is a navigational element in a user interface that provides contextual information about the current location of a user in an application or document. Breadcrumb trails provide links back to each previous page the user navigated through to get to the current page or — in hierarchical site structures — the parent pages of the current one. On archival descriptions, the breadcrumb trail is located at the top of record’s view page when viewing a child decription to provide information about where in the hierarchy the current description appears. When moving archival descriptions (see: Move an archival description), a breadcrumb trail is used to indicate where in a hierarchy the Move browse results are currently showing. At the top of archival institution and authority record view pages, the breadcrumb trail is used to provide a link back to the Browse page for each kind of record. In AtoM, breadcrumbs (i.e. individual components of a breadcrumb trail) are expressed as hyperlinks, and can be clicked to navigate to the related source or parent record. Clicking a term such as a subject or place in an access point will bring a user to a Browse page listing results for other desriptions that have also been tagged with the same access point. The sort button is a navigational element that appears on some browse and search pages throughout AtoM. It allows a user to change the sort order of the results being displayed. Common values used in the sort button as it appears in AtoM include: Alphabetic, Relevance, Identifier, Reference code Most recent, or Start date and End date. On search and/or browse pages, the Sort button appears as a small drop-down menu at the top right of the results. Hovering over the button reveals the option currently not selected - a user can click this option in the drop-down menu, and the page will reload in the new sort order. When the sort order is set to “Alphabetic,”results are organized A-Z. Note that this is an ASCII sort - see the IMPORTANT note below for more information. When results are ordered by “Most recent,” the most recently added and/or edited records in the results will appear at the top of the list, allowing users to discover new or recently updated content. When the sort order is set to “Identifier,” results are displayed by the identifier, based on an alphabetic ASCII sort (more information on ASCII sort is included in the IMPORTANT note below). When the sort order is set to “Reference code,” (on the archival description browse page) results are based on the full inherited reference code, and NOT on the individual identifiers of each record, regardless of whether or not reference code inheritance is turned on in Admin > Settings or not. For more information on reference codes vs. identifiers and display options, see: Inherit reference code (information object). When the sort order is set to “Start date” or “End date” (currently only available on archival descriptions), AtoM will order the results by the internal, ISO-8601 formatted (e.g. YYYY-MM-DD) start date or end date values - not the display date shown to public users, which is a free text field allowing users to express approximation or uncertainty. Results without a start date value or end date value will appear last. Elasticsearch does not naturally apply alphabetic sort in a human-friendly way (what is often known as “natural sort” in computer science) - instead, it applies what is known as ASCII sort, based on the order of the characters in the ASCII character encoding scheme. Consequently, some results may appear out of order, depending on how the titles have been entered. Artefactual hopes to improve sorting in AtoM for future releases. 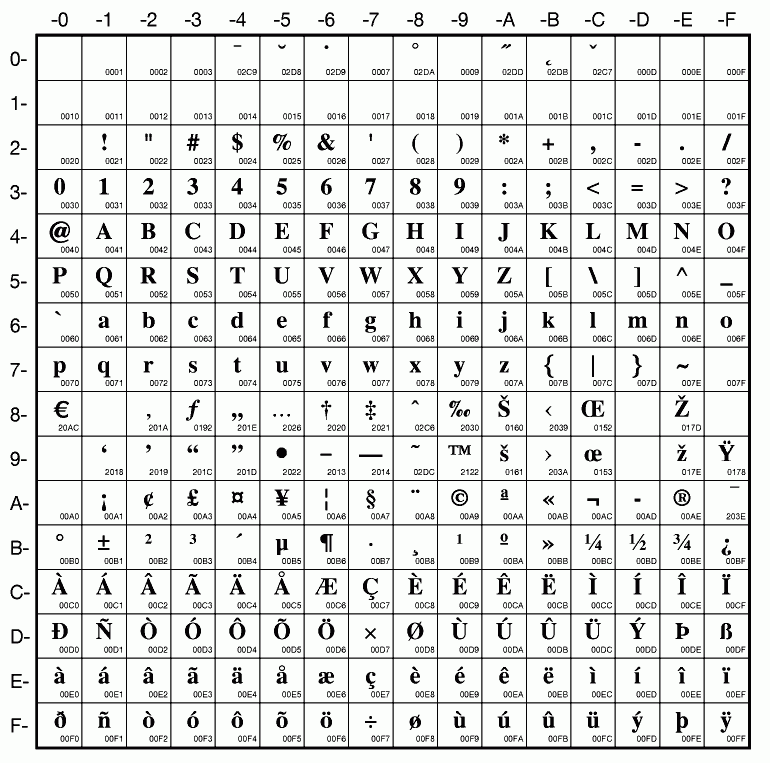 In the meantime, below is an image of an ASCII table - sort order is determined based on this schema - so that a description whose title starts with “A” will be preceded by one starting with a number, which in turn will be preceded by one beginning with a quotation mark, which will be preceded by a description that begins with a space before its first character. If you are concerned about sort order, be sure to consider this when naming your records. Institution logos are theming elements that can be added by an administrator to an archival institution record. As part of the institutional theming module, an archival institution record can be customized by adding a logo, banner, custom background color, and/or customized descriptive content - see: Edit the theme for an existing archival institution. Some theming elements, such as a logo or a custom background color, will also be applied to any related archival descriptions, offering user a visual cue as to which institution holds the current description. When a logo has not been uploaded, a placeholder, which displays the institution name, will still appear on the institution record and any related archival descriptions. In addition to providing a customized look and greater context when viewing related archival descriptions, the institutional logo also acts as a navigational element: the logo (or its placeholder if no logo has been uploaded) operates as a hyperlink to the related archival institution. This allows a user to quickly navigate to the institution’s record to find out its location, opening hours, etc. as well as to view a list of other holdings held by the archival institution. 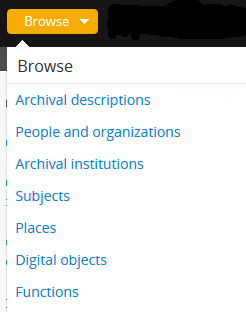 On archival institution records and related archival descriptions, the institution logo appears on in the top-left hand corner of the page, in the context menu. On related archival descriptions, it is positioned above the treeview; on the archival institution record page, it is positioned above the list of related holdings. Additionally, institution logos are used on the archival institution browse page (available via the browse menu), the logos (or logo placeholders if no logo has been uploaded) are presented to the user in a tiled browse layout, with the title appearing below the logo in grey. Institution logos on the Archival institution browse page. In the image, the Alberton Museum and the Alex Youck School Museum represent institutions without uploaded logos, showing placeholders instead.